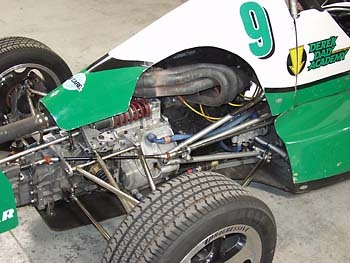 The F2000 Cars are purpose-built race cars. No 5 m.p.h. bumpers. No air conditioning. No stereo. No leather. And no cupholders! Here's a look at what they are about. In this shot you can see the tach, front and center. 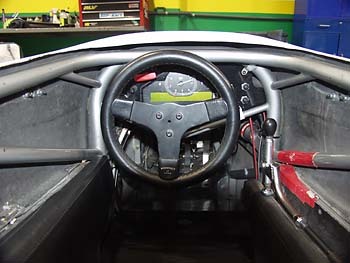 There is a simple toggle switch to turn the ignition on, and a pushbutton to engage the starter. The tachometer is redlined at 5800 RPM; the rev limiter cuts in at 6100. You can also see the digital instrument panel, which by default reports speed, water temp and oil temp. Passing a radio beacon on the track changes the display to report lap time for about 3 seconds. A yellow idiot light warns of engine problems, and a red idiot light lights when it is time to shift. An array of four buttons on the right are used to manipulate the display and data acquisition system. The red handle on the dash is for the fire system, and the black knob on the right is the shifter. The steering wheel is removable - a good thing or you'd have a heck of a time getting into the car. The frame is just wide enough for me, with my shoulders firmly wedged between 1" thick pads on both sides. 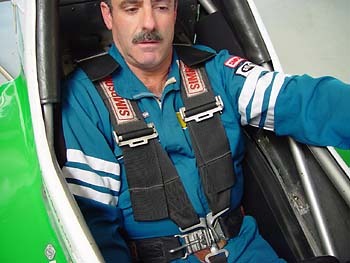 The cars are fitted to each driver; you send your height and weight in advance. The pedals are adjustable, and an assortment of pads provide the rest. You are well supported, but we found we had to consciously relax to let the pads support us in the corners. The collection of grass in the lower tray suggests what this car might be doing in the shop. (No, it wasn't me!) Here you can see the block, headers, exhaust, inboard shocks, A Arms, and disc brakes (they are really oversized for a car of this weight - but they sure as hell don't fade!) 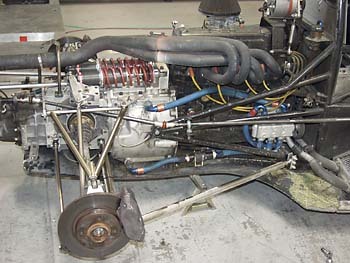 The long, articulated rod (almost the whole width of this photo) is the shift linkage. A little sloppy - Carroll Smith would not approve. 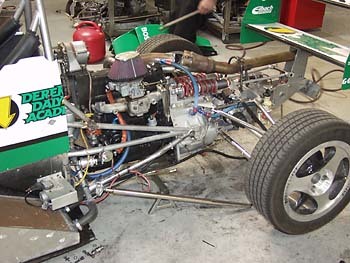 You can also see the transaxle and its plumbing to an external oil cooler. 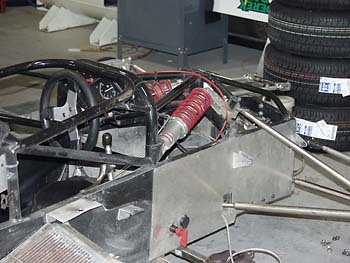 This side shows the 2-barrel carburetor (rather primitive these days) with its K&N air filter, the rear wing, the side-pod mounted radiator and the data acquisition black box. The 4-into-1 straight-though exhaust has been disconnected from the headers in this shot - I don't know if the engine was coming out or going back in. Here you can see the front of the car, under the covers. Note the inboard shocks, emergency electrical switch, heavy-duty steel tube frame, and energy-absorbing panels around driver tub.